Burn rice recipe with chicken or anchovies with equally good anyway, if you've ever tasted. If not then it is time to make this food because making a relatively easy and simple. Roasted rice has become the food was quite enjoy doing everyone, but I clay lately been rarely sell them. Therefore we still have to preserve foods archipelago to continue to exist, because this is one food that has its own characteristics in terms of both taste or appearance. If there is a chicken roasted rice can be eaten during the day or fitting dinner, but more comfortable fit during the day anyway. You can choose the drink like iced fruit or other fresh beverages. So wanted to make a straight yes after I described above before, then you should see just so in order to better understand its manufacture. Manufacture almost like grilled chicken cuman difference in materials and others. Saute onion, red pepper until fragrant. Then add water or milk (choose one only yes), lemongrass, bay leaves, anchovies field, flavorings, sugar. stirring constantly until boiling. Add rice, stirring until evenly distributed. Then cover the pan and cook approximately 30 minutes using a small flame until cooked. Turn off the heat and let stand about 10 minutes. 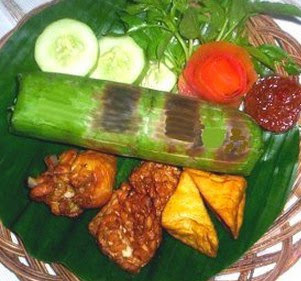 Take the rice and wrap in banana leaves like rice cake. Then roasted until done, approximately lest banana leaf burn. Deh already finished and ready for you to serve with other complementary materials.